JohnnyTwoToes feels this Irish Drama is a missed opportunity! This is the plot synopsis for Calvary, John Michael McDonagh's latest film on IMDB. Their words not mine.."After he is threatened during a confession, a good-natured priest must battle the dark forces closing in around him." Okay, I'll buy that. Interesting as it sounds, sadly this is not a supernatural horror movie. It is a talky Irish drama with Brendan Gleeson as the Priest who is threatened. He has one week to get his affairs in order before he is killed by one of his flock for past sins committed by other priests when the killer was a child. Still sounds interesting? I don't know what town this was but it is one town I would avoid like the plague. With the exception of the Priest and an ailing American writer (M. Emmet Walsh) there is not one character that is likable. Where the film Lucy failed to make any characters that had any depth, Calvary does the exact opposite. We get to know them and can't stand any of them, less the two I have mentioned. Calvary does have its moments of levity, but I was unsure if they were intended as laughs or the laughs were unintentionally intended. I found myself laughing but uneasy, still. The townsfolk are a bunch of narcissistic losers and sad sacks that spend most of their time swilling booze and mocking the Priest. Why he would not want a transfer is beyond me. If It had been me I would have said, "Why wait a week to kill me?" Gleeson does shine as the Priest. He is a kind, compassionate and an ULTRA PATIENT man who knows his calling and continues to do God's work, the best he can. But even the Priest has his limits, as you will see. McDonagh wrote and directed the infinitely better The Guard which also starred Gleeson as a local cop teaming up with an FBI agent (Don Cheadle) to bust a drug ring. That film was a masterpiece filled with terrific performances by the leads and a terrific script by McDonagh. He had an eye and an ear for clever dialogue in that film and knew how people would talk to each other. It was blisteringly funny, foul and Gleeson is a sheer joy to watch. Calvary also has some of the same clever dialogues but the film goes nowhere with it. It tries and Gleeson does a fine job in carrying the film, but I was so repulsed by the supporting characters that my sympathy for their problems was slight at best. Kelly Reilly is sweet as the wounded daughter of the Priest who comes to visit after she has some issues with addiction. It seems the Priest WAS married, but his wife died and that is when he became a man of the cloth. The film basically centers around the Priest finishing he duties to the final climax and it is hit and miss. Some are more interesting than others but the ending is depressing and the final scene of the daughter is especially disturbing. 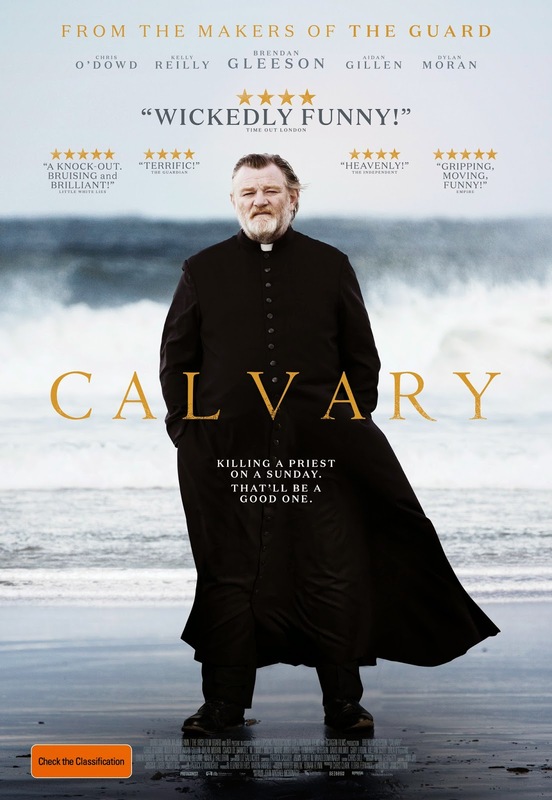 Calvary is not a bad film but it is, for the most part, dull, uninteresting and plods along at a snail's pace. I love dialogue driven films if they are saying something interesting, challenging and have some depth to their conversations. There has to be energy and vitality to the characters so we can relate to them and feel their pain. Unfortunately, Gleeson is the only character I connected with or maybe that is the way it was supposed to go, but it seems for the story to work I had to feel something for the others. I felt nothing but anger towards them.